To obtain a copy of the trail map please send a #10 or 4"x9" self addressed envelope with $ .60 postage to the Minnesota Horse Council address and one will be mailed to you. For more copies please add additional postage and send a larger envelope. About 10 years ago, the Minnesota Horse Council recognized that horse trail issues were becoming an ever-larger part of its activities, significant enough that the Council decided to form a sub-committee to help provide support and financial backing for the maintenance and development of equine trails. This was the start of the MHC Trail Blazers. 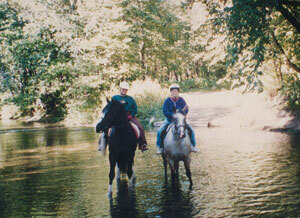 We represent horsepeople in various statewide trail organizations. The Trail Blazers has been actively involved in organizations such as the MN Recreational Trail Users Associ ation and the MN Parks & Trails Council. We also represent equestrian trail users before the Minnesota Legislature on matters such as landowner liability on trails and appropriations for parks and trails funding. We serve as a liason between government bodies and local trails organizations. The Trail Blazers have developed good relationships and contacts with the MN Department of Natural Resources and the federal wilderness area managers. We recognize that we cannot ourselves deal with each trail state-wide; that is best done by the local trail user groups. What the Trail Blazers can do is provide advice to local trails groups, put them in contact with the right trail manager, and when necessary, intervene with someone at the state office. There is no specific deadline for submitting requests for funding; each request will be evaluated as it is received. Our Trails committee will try to give a preliminary response within 1 month of receiving the request for funding. However, trail work is frequently done in cooperation with the state or federal government, or as matching funds. Major trail projects often require lengthy planning and approvals; projects sometimes take 2 to 3 years of planning before actual work on the trail begins. The procedure for applying for trails assistance varies depending on the project. The best way to start is to call one of the Trail Blazers committee members listed below, to discuss the specific project. We can then tell you what information is needed to apply for Minnesota Horse Council funds to assist in your trails project.